My brother's area just got upgraded to an ice storm warning. He's a bit south and west of me. We're in the 0.5" to 1.0" range for ice accumulation and then snow/sleet accumulation of 4-6". So no driving tomorrow for me. 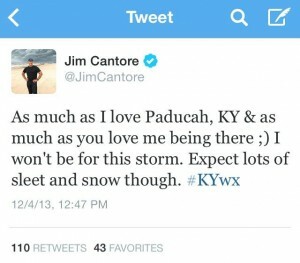 And poor Jim Cantore... no one in the US wants him to visit. Don't know why. It's like the actor John Dye that played the Angel of Death in Touched by an Angel. He said in an interview that people were always scared when he boarded a plane with them. Hugs! Stay safe and warm!